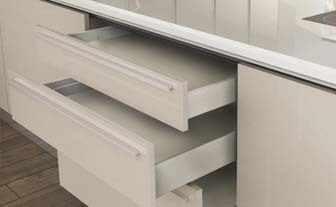 EBCO’s Linea Box, marketed under the Livsmart brand, is a unique and unparalleled drawer which can be 3-sided in metal and also 2-sided. At 9mm, it is probably the thinnest drawer systems on the market. This Salice product comes in two heights – 104mm and 180mm.